Government will not take lightly the planned disruption of schools’ opening next week and will take appropriate disciplinary measures against teachers who participate in the mooted illegal industrial action, a senior Government official has said. 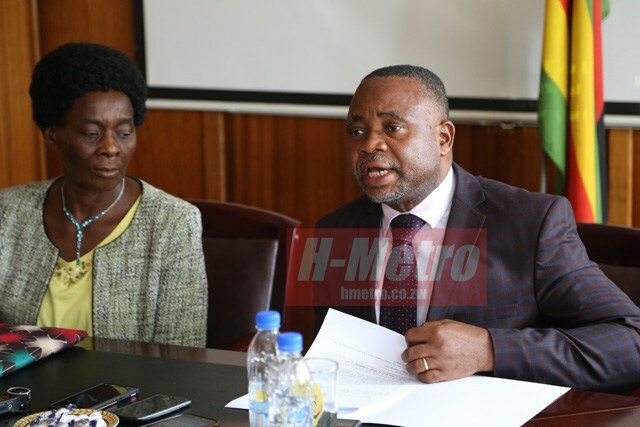 Primary and Secondary Education Minister Professor Paul Mavhima yesterday warned educators against engaging in the planned illegal strike saying authorities will not allow the situation in the education sector to degenerate into chaos. Authorities are watching closely and studying the agenda behind the recent spate of strikes by employees in key sectors, amid suspicion that politically tainted union leaders are coordinating the industrial actions for reasons other than the welfare of their members. On Friday, the Zimbabwe Teachers’ Union resolved to withdraw its members from work on April 8 to push for a salary review and reinstatement of vacation leave. Recently, public sector nurses went on a nationwide strike that nearly crippled the country’s health delivery system in spite of their grievances having been addressed by their employer. As a result, over 5 000 nurses were dismissed for participating in the illegal job action. However, the nurses’ association quickly abandoned the illegal action following revelations that the action was politically motivated. Now the nurses’ association is calling for a meeting with Government to offer a formal apology. Minister Mavhima said schools will open despite the threats of a strike by educators. He said: “The pressure that these unions are attempting to put on Government should be viewed in the correct context; that of trying to follow the same route taken by doctors and, more recently, nurses. “As Government we have always engaged unions when it comes to the issues of the welfare of teachers. The minister said unions should understand that Government was working on reviving the economy which will translate to better conditions of service for its workers. “The unions need to understand that this is a new administration focused on reviving the economy and every patriotic Zimbabwean should work with Government to help in the efforts to revive the economy,” he said. “This is so because when the economy grows, the working conditions of all workers and not only teachers will gradually improve. “However, from Government’s side there is little scope for improvement of remuneration because of the financial situation. The Ministry of Finance has no capacity at the moment to improve their salaries. “The education sector employs the highest number of people in the civil service, which makes it difficult to have a wholesale review of their salaries given the financial problems we are facing. “The education sector is an essential service such as the health sector, and according to the country’s laws, it is illegal to withdraw a service in that sector. “This is the message I will tell them when we meet on Wednesday because they cannot hold the whole nation at ransom. “There are those who are saying schools will not open, engaging in an industrial action and forcing schools to close are two different things. It is illegal to forcibly close schools. However, some elements leading the teachers were adamant that they will embark on the proposed job action. Zimta president Mr Paul Gundani said teachers would forge ahead with the strike. He told The Sunday Mail last night that conditions of service for teachers continue to deteriorate. “We have engaged Government on the vacation leave issue, and exhausted all possible ways and Government has remained adamant since 2016,” said Mr Gundani. “The 2014 agreement with Government on a Poverty Datum Line (Pay scale) has been ignored in spite of our persistence through the consultative process we have with Government. “The Zimbabwe Constitution has been in existence since 2013 and yet up to now a Collective Bargaining Council has not been put in place. “The same statement of looking into our welfare has been made over many years since the agreement of 2014. “Conditions continue to deteriorate and this strike is a last resort.” The Amalgamated Rural Teachers’ Association of Zimbabwe (ARTUZ) said its members will participate in the industrial action. ARTUZ president Mr Obert Masaraure said: “As a principled union, we are going to participate in the strike. “Maybe that is the only way we can put pressure on our employer to take action. We are not happy with the rural allowance we are being given which is US$14. The employer is ignoring the welfare of rural teachers according to Section 65 of the Constitution which deals with collective bargaining. “We have not been given a chance to air our views. We requested nothing more than a meeting with the employer but nothing materialised. We demand a 100 percent review from the employer and anything below that we will just take and go on with the strike. Educationist Professor Caiphus Nziramasanga warned teachers against following the bandwagon. “I think they (teachers) are trying to follow the bandwagon,” said Prof Nziramasanga. “Doctors and nurses did that and they got money, so they think if they strike they will get money too. “That is bandwagon thinking; whether the strike is right or not is something debatable. “To be practical, it is definite that teachers’ salaries are very low. “I support their demand for better salaries. Their work and effort needs to be appreciated and their reasons for wanting to strike are understandable. “I’m sure the Government is seized with the issue but Treasury cannot address all their concerns at once considering that teachers are a large group and if their salaries are increased they take up such a big chunk from the pot. “But teachers have a right to ask. I’m sure the Government is ready to talk and if rationality takes over the issue should be solved amicably. “This should not result in pupils suffering. Inasmuch as is our right as teachers to strike we should see to it that exercising our right does not infringe on the rights of children.